MAVEX are excited to be exhibiting again at Olympia Beauty in 2017 and for the first time will be showcasing their highly active, results driven facial ranges on their Stand: B39. The Forever Ganoderma extract facial range has been proven in studies to show a cumulative effect on smoothing wrinkles, refining pores and improving skin tone and hydration. It really does change and improve skin with continued use. The oxidant rich velvety 2-in1 Cleansing Milk is a wonderfully relaxing and aromatic start to the facial which is then followed by the unique combination of seven different acids in the AHA/BHA peel that gently dissolves keratin plugs while exfoliating dead skin cells. This prepares the skin to accept the nourishing ingredients of the Hyaluronic Lifting serum which benefits skin by having both low and high molecular weight HA allowing it to be deeply absorbed into the skin. After massaging the HA Lifting Serum into the skin, an Alginate Mask is prepared and applied to the skin. This mask improves absorbency of the HA Lifting Serum into the skin while also providing a delivery mechanism for additional nutrients such as zinc, calcium, copper and iron, along with Ganoderma extract, which help repair and revitilise the skin and prevent wrinkle formation. The Alginate Mask peels gently away to reveal a more luminous and glowing complexion. 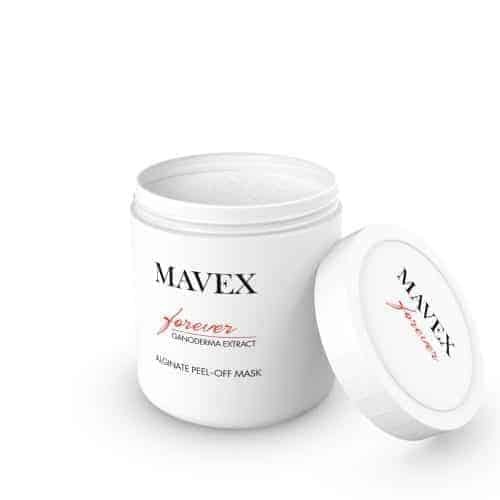 The final stage of this MAVEX facial treatment is the nourishing 24 Hour Cream which is formulated with the highly active Acetyl Hexapeptide-8; a molecule with a powerful effect similar to that of facial fillers. It reduces the contraction of facial muscles, effectively and visibly flattening expression wrinkles. The Ganoderma Extract fights skin ageing and stimulates cell turnover and the pure hyaluronic acid encourages proper cell function and retention of hydration creating a ‘plumper’ effect to the skin. Apple Stem Cells stimulate collagen and elastin production, and Argan Oil provides a wonderful softness and further nourishment to the skin. The in salon results can be supported with beautifully presented retail items that contain the same highly active ingredients that will fly off your shelves.